After Helen’s Story received its nomination for the Shirley Jackson Award, Charles Tan posted an interview with me on the awards website and Kristin Centorcelli interviewed me for SF Signal. And Kristin asks me about the inspiration behind my novella, the influences on my writing, and what’s up next for me. I also got to convey my gibbering excitement at receiving the nomination and enthuse about Clive Barker’s Weaveworld. 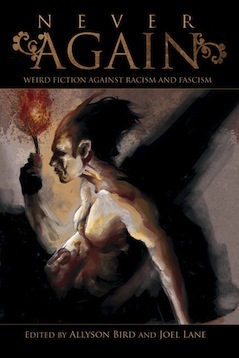 Here are two interviews about the anthology of anti-fascist speculative fiction, Never Again. Edited by Joel Lane and Allyson Bird, this charity anthology was published in 2010. It includes my story “Survivor’s Guilt”. “Story notes” Spectral Press editor Simon Marshall-Jones spoke to me and other contributors about their influences and sources of inspiration for their stories. “Art is bread” Alan Kelly interviewed me for the Fangirltastic website, along with the other female contributors to Never Again. Here I talk about “Survivor’s Guilt” and my related (unpublished:) novel Noise Leads Me and its take on history, revolution and creativity.